The 6th India – Myanmar Joint Trade Committee (JTC) Meeting co-chaired by Smt. Nirmala Sitharaman, Minister of Commerce & Industry from India and Dr. Than Myint, Union Commerce Minister from Myanmar was held on 27th June 2017 at New Delhi. The Joint Trade Committee plays a key role in facilitating issues related to enhancement of the bilateral economic partnership between the two countries. Stating that Trade and Commerce play a significant role in the bilateral relationship of the two countries, Smt.Sitharaman noted that India’s trade with Myanmar grew by 6.01% from USD 2.05 bn in 2015 -16 to USD 2.18 bn in 2016-17. The total export achieved in 2016-17 was 1.11 USD Billion, reflecting an annual growth of 3.79%. The import stood at 1.06 USD Billion showing a growth of 8.43%. The Minister stated that the bilateral trade between either countries has a much larger untapped potential. She sought the cooperation of the Myanmar side in actively pursuing enhanced road, sea and air connectivity between the two countries. Highlighting the progress made by India in various components of the Kaladan Multimodal Transport Project, she sought the cooperation of the Myanmar to expedite work on their side. She highlighted the need for the Myanmar side to allow expeditious completion of the inland waterway works linking the Port of Sittwe to the Myanmar hinterland. She drew the attention of the Myanmar side to an expeditious negotiation of a Motor Vehicle Agreement bilaterally which would facilitate seamless movement of cargo vehicles. During the meeting discussions were held on exploring the feasibilities of direct shipping lines with Sittwe port and Vizag/ Chennai. Similarly, the need for direct air connectivity with Chennai/ Guwahati was discussed. Noting the progress made on border trade, ever since both countries did away with barter trade and opened the border posts for normal trade w.e.f. 1.12.2015, the Minister sought the cooperation of Myanmar side in quick finalisation of the Mode of Operation(MoO) for making the Border Haats functional on the ‘India-Myanmar border’. It was noted that 10 points spread across 4 states viz., Arunachal Pradesh, Mizoram, Nagaland and Manipur, have been identified for operationalising Border Haats. Both sides also agreed to explore opening of two new Border Trade Points at Pangkhuwa and Zoninpuri. Both sides also agreed to deepen their engagements in some of the mutually identified core sectors. Comprehensive MoUs would be explored in areas of Health Care and Textiles. The MoUs on capacity building between RBI and CBM signed on 22 September, 2015 and on cooperation in the field of Power Sector signed on 19 October, 2016 will be operationalised quickly. The proposed MoU between RBI and Central Bank of Myanmar on currency exchange rate fixation also needs to be expedited. Myanmar side was also requested to explore the suggestion of opening of a Counsellor Office in the North-East. Minister also highlighted that Project Development Fund for CLMV is under implementation. Since the first Inter-Ministerial Meeting on 25.4.2017, projects have been identified for preparation of DPRs and new areas have been identified for conducting pre-feasibility studies. Project identified for Myanmar for preparation of DPR includes setting up of a Multi-Specialty Hospital and/ or Medical College and an Educational Institute in Myanmar. It is proposed to consider Nursing and Paramedics Education for the pre-feasibility studies for the FY 2017-18. The Minister sought the cooperation of Myanmar in extending all assistance to EXIM Bank to facilitate implementation of the Projects. Smt. Sitharaman stated that the 4th India – CLMV Business Conclave has emerged as the main B to B forum for countries of the region and India. The 5th Edition is now poised to be organized in Cambodia. She expressed the hope that the Conclave along with JTIF set up by the Ministry will help faster growth of business to business contacts and FDI inflows between the two countries. 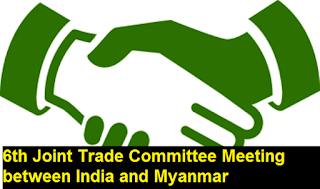 The Minister requested the Government of Myanmar and its business community to actively partner in India’s initiatives to strengthen her manufacturing capacities, viz ‘Make in India’ and stated that India is also ready for a similar move in Myanmar. She expressed hope that together we can deepen our manufacturing capabilities, learn from each others experiences and create a better regional platform for trade and commerce.